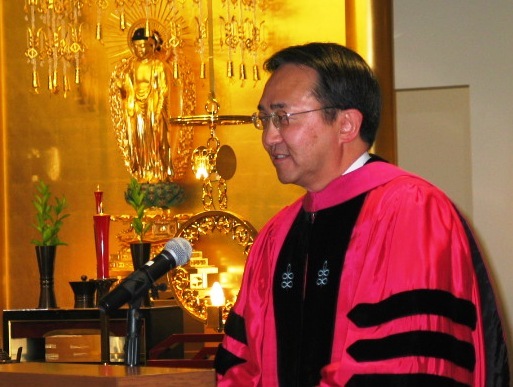 Dr. Leroy M. Morishita, a member of the Berkeley Buddhist Sangha Temple, was elected as the Seventh Chair of the Institute of Buddhist Studies Board of Trustees in January 2010. At the local temple he served on the scholarship committee and coached various levels of basketball teams for thirteen years. Dr Morisitaâ€™s educational background is as includes a BA in Psychology from the University of California, Berkeley, MS in Counseling, San Francisco State University, and EdD, Harvard Graduate School in Education. Currently he has senior administrative positions in the area of Administration, Finance, Information Technology, Human Resources, Capital Planning, Facilities Management, Enrollment, Housing and Institutional Research for San Francisco State University. He is the Executive Vice President/CEO for Administration and Finance at CSUSF. He is a Commissioner with the Western Association for Senior Colleges and Universities and a former president of the Asian Community Health Services. He is a member of the San Francisco Planning and Urban Research Association, Japanese American Citizens League Health Benefits Association, Asian Pacific Americans Higher Education Board, National Association of College and University Business Officers, Society for College and University Planning, and Western Association of College and Universities Business Officers. Dr. Richard Payne, IBS Dean, initially thanked Mr. Tom Yuki for acting as the interim IBS Chair for two years and welcomed Dr. Morishita as the Chair of the IBS Board of Trustees. He expressed his hope that with Dr. Morishitaâ€™s extensive background in education, the IBS will continue to grow as an educational institution dedicated to the study of Buddha Dharma and Shin Ministry. Since inception in 1949, as the Berkeley Buddhist Study Center, the center name was changed to the IBS in 1966 with the hopes of establishing an education center of ministerial study in the United States. With the start of IBS program six individuals guided the IBS, as Chair of the Board of Trustees. They were: the late Albert Kosakura from 1966-1968, former BCA President and a member of the Berkeley Buddhist Sangha; Dr, Ryo Munekata , 1969, former BCA President and member of the Los Angeles Buddhist Temple Betsuin; Motomi Yokomizo, 1970-1990, former BCA Vice President and member of the Oakland Buddhist Temple; Dr Jack Fujimoto, 1990-1993, President of Sacramento City Colleges and member of the West Los Angeles Buddhist Temple; Dr. James Doi, 1994-1996, former Dean of Education at University of Washington and member of the Seattle Betsuin; and Hiroji Kariya, 1996-2007, former BCA President and member of Mr. View Buddhist Temple.